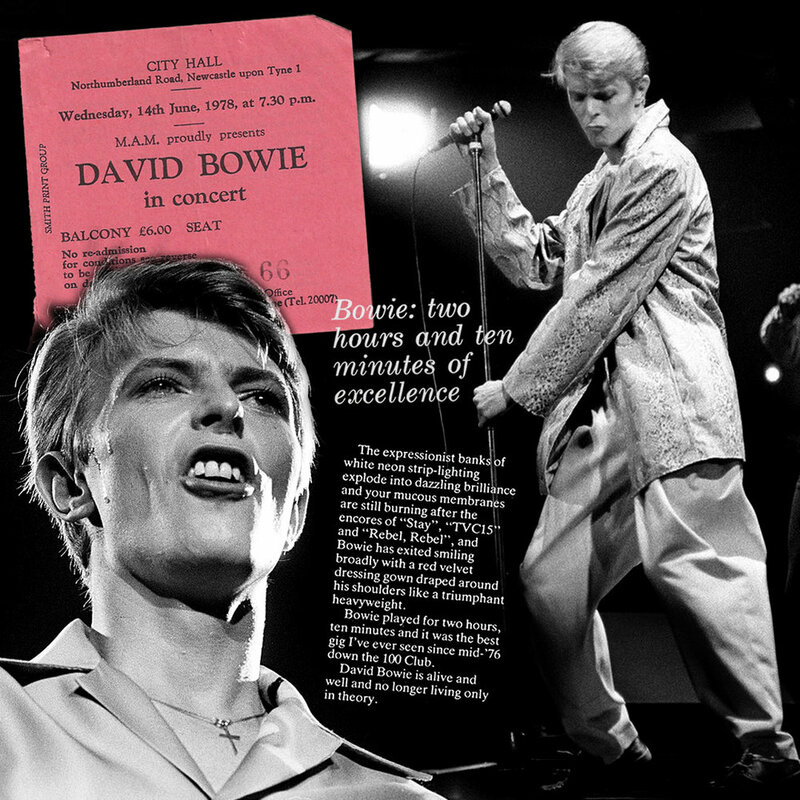 35 years ago tonight and almost ten years since he had retired Ziggy there in 1973, David Bowie returned to London’s Hammersmith Odeon in aid of the Brixton Neighbourhood Community Association. Today is also the official release date of Denis O'Regan’s Ricochet, a bloody great big boxed set of 5 books, an exclusive vinyl 12", 3 signed prints all beautifully designed and housed in an enormous acrylic case...did we say, it's massive? Anyway, to mark the official release of Ricochet and the anniversary of the Hammersmith show, Denis has kindly given us these exclusive shots from the night. 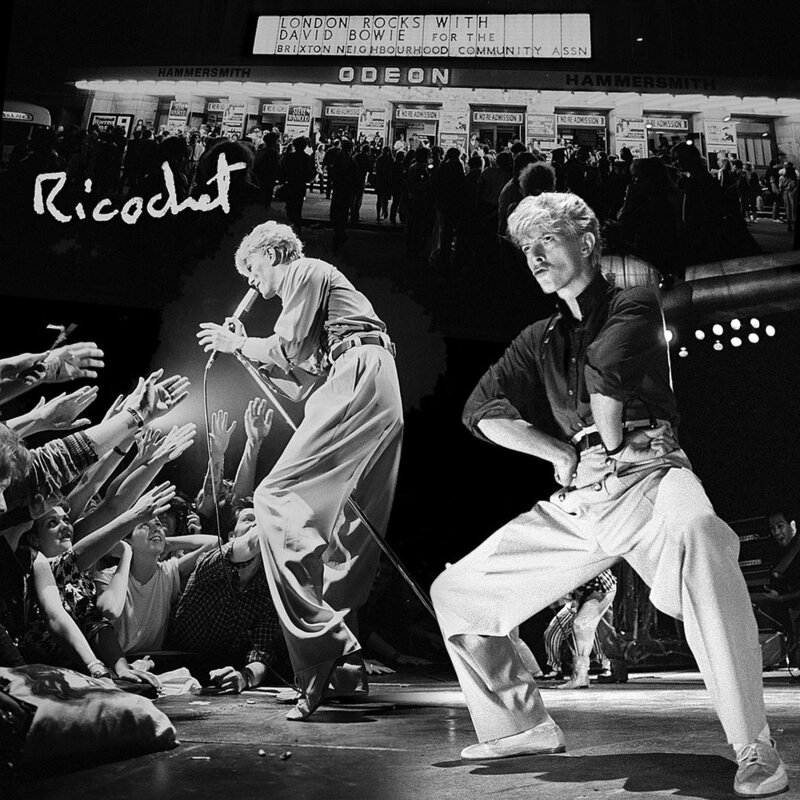 Serious David Bowie vinyl collectors will be in awe of ‘Ricochet : David Bowie 1983’. Included in the 15 kilo (33 pound) acrylic cased boxed set of five photographic books by Denis O’Regan is a 12 inch red vinyl single: A-side ‘Ricochet’, B-side ‘Let’s Dance’, both tracks remastered in 2018 by Nile Rodgers. The vinyl itself - along with the boxed set - is limited to only 2000 copies. It will never be made available outside of this collection, and is released on June 30th 2018, the 35th anniversary of David’s ‘Serious Moonlight’ charity concert at London’s Hammersmith Odeon in aid of the Brixton Neighbourhood Community Association. In addition, the boxed set contains three signed and numbered fine art limited edition prints. Each one is accompanied by a digitally authenticated certificate. Another certificate authenticates and describes the collection within the acrylic case - including the vinyl - and features a David Bowie estate stamp inspired by the ‘ex libris' mark that David attached to his personal book collection, designed for Moonlight Books by ‘Blackstar’ artist Jonathan Barnbrook. It too is invisibly stamped with digitally created DNA and referenced in the Tagsmart online database that can be accessed online by the buyer. It also contains a pair of white gloves for cleaner handling. True! As with several previous paintings, today’s likeness returns to that timeless source of visual inspiration, Bowie as the universe’s most beautiful alien, Thomas Jerome Newton, in the film The Man Who Fell To Earth. You can enjoy all of the pieces on display at the exhibition for a little over a fortnight, as the exhibition closes on July 15th. Tickets and details of other Bowie-related events at the Brooklyn Museum here. Don’t forget exclusive (strictly ‘bricks and mortar’ only), vinyl reissues for retail stores today, including Christiane F. – Wir Kinder Vom Bahnhof Zoo on red vinyl and a 10" trifold sleeve of David Bowie In Bertolt Brecht’s Baal. Read more regarding both here. Forty years to the day since David Bowie began his three day stint at Earl’s Court in 1978, Parlophone issues the best-selling Record Store Day release on CD and digital. Don’t forget exclusive ‘bricks and mortar’ vinyl reissues for retail stores today, of Christiane F. – Wir Kinder Vom Bahnhof Zoo on red vinyl and a 10" trifold sleeve of David Bowie In Bertolt Brecht’s Baal. The August 2018 issue of MOJO (MOJO 297) has 13 pages (plus cover), dedicated to the story of Let’s Dance. COVER STORY: 35 YEARS ON, THE EXTRAORDINARY story of David Bowie’s Let’s Dance and Serious Moonlight – his rollercoaster ride to fame and riches, weirdness and regret – with new interviews with Nile Rodgers, Earl Slick, Carlos Alomar and more. COVERMOUNT CD: DANCE THE BLUES 15 tracks mining the classic R&B that inspired David Bowie to dance the blues: Little Richard, Johnny Otis, James Brown, Earl Bostic, Albert King and more! 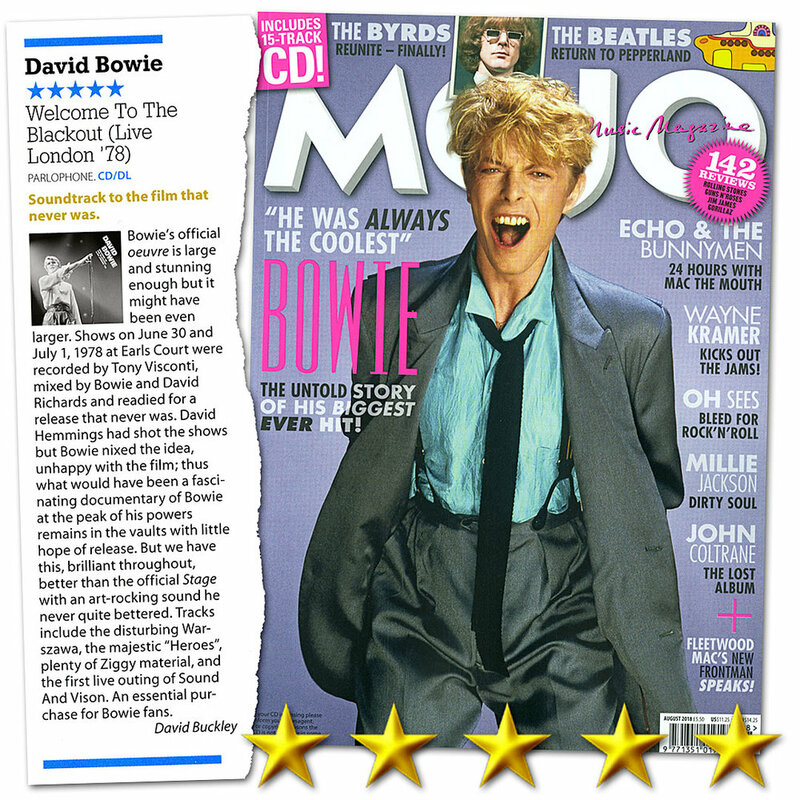 Go here for more detail regarding the August issue of MOJO, which is out on June 26. The new issue of Classic Rock magazine (#251, Summer 2018), has fifty pages of Bowie-related content, including the cover, a full-page advert for next week’s Welcome To The Blackout release, thirteen pages dedicated to "BOWIE: His Greatest Songs" and a separate 24-page Bowie photo supplement, confusingly called "BOWIE BACKSTAGE", containing 26 classic Bowie photographs, of which, just 5 are actually backstage. The magazine also has a 4-page article on the criminally underrated Pin Ups album with recollections of the recording sessions from Mike Garson, not to mention a 6-page Mott The Hoople retrospective, though we just did. The "BOWIE: His Greatest Songs" feature has a chronologically listed 58 songs chosen by a similar number of rock luminaries. The selections inspired us to create a Spotify playlist of over four and a half hours. 08 - Life On Mars? 56 - Where Are We Now? David Bowie’s Life On Mars? single was released forty five years ago today in the UK, June 22nd, 1973. Though taken from the 1971 classic, Hunky Dory, it wasn’t released in its own right until 1973. Possibly capitalising on its popularity as a live number during the Ziggy Stardust shows in 1972, the song wasn’t actually performed often on the Aladdin Sane Tour of 1973, during which it was released. Nevertheless, it reached #3 on the official UK singles chart. Pictured here is a still from Mick Rock’s beautiful Life On Mars? promotional video. Alongside it are the sheet music, the music press advert and the single cover (all UK) and the US Hunky Dory cover. David’s handwriting at the top of the montage is taken from the original US trade advert for Hunky Dory, wherein David had scribbled a few notes on a piece of headed hotel stationary from The Warwick in New York regarding each of the tracks on Hunky Dory. Taking into account the insertion and crossing out that David made to his original annotation, the entry for Life On Mars? read: “Life on Mars - This is a sensitive young girl’s reaction to...The Media.”. However, a bit of close quarter scrutiny reveals what he had originally written: “Life on Mars - This is a sensitive young girl’s reaction to songs like My Way, films like Love Story and newspapers.”. This is kind of ironic considering the note Bowie scribbled for Life On Mars? on the back sleeve of Hunky Dory read: “INSPIRED BY FRANKIE”, a reference to My Way being a part of the song’s history. But that’s a whole other story. Watch Mick Rock’s reworked video for Life On Mars? (2016) on the Official David Bowie YouTube channel. Unfortunately, the creators of the majority of the works collected are unknown, but it would be a great help if anybody reading this has more information, be it the artists themselves or somebody who knows them. This method has proved quite successful so far. Today’s painting depicts Bowie as Paul Ambrosius von Przygodski in the 1978 David Hemmings-directed, Just a Gigolo. The original photograph was taken by Christian Simonpietri. You can enjoy all of the pieces on display at the exhibition for just three more weeks before the exhibition closes on July 15th. David Bowie is officially hit 2,000,000 visitors today. The feat was marked this afternoon at the Brooklyn Museum where a very appreciative Bowie fan, Nicole, received a signed lithograph of a Bowie self-portrait (used for the Outside album cover), a limited edition of the David Bowie Is book, a pair of Sennheiser headphones, and a premium subscription to Spotify. 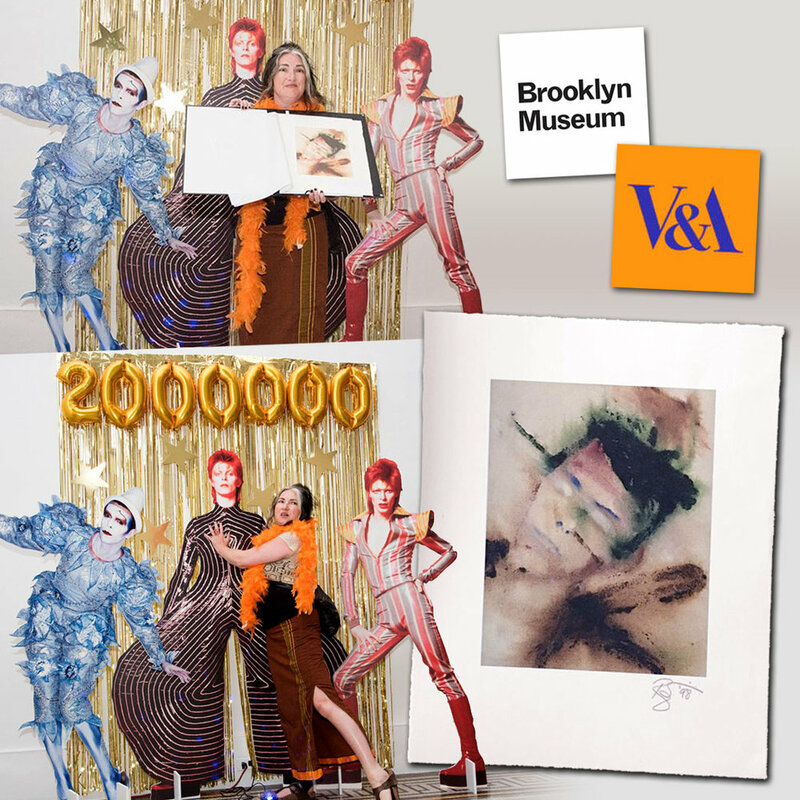 David Bowie is has officially hit 2,000,000 visitors! As the final stop of its global tour, we are thrilled to be part of this milestone day and to name Nicole as the lucky visitor! She’ll be traveling home to Dublin, Ireland with a suitcase full of swag from @vamuseum, @brooklynmuseum, @davidbowie, @sennheiser, and @spotify. Not only is she an avid Bowie fan, but this is also Nicole’s first trip to New York—Thanks for letting us be part of your New York experience! 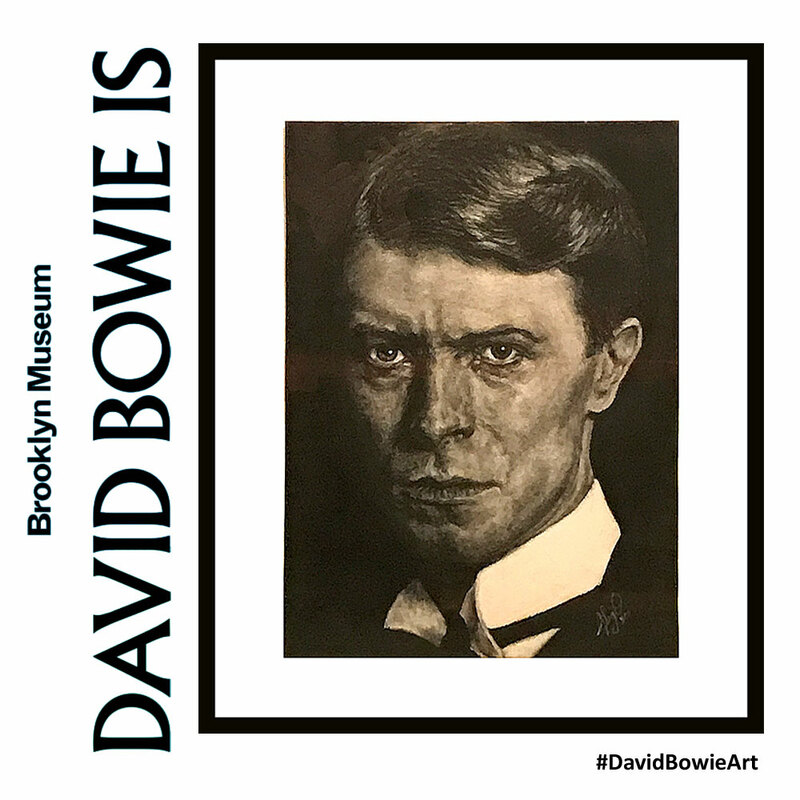 David Bowie collected all of the fan art he was sent over the years and now the @brooklynmuseum has fulfilled his dream that one day they should be exhibited. We’re posting a piece online every Friday with the hashtag #DavidBowieArt. As with several previous paintings, today’s likeness is of Bowie as Thomas Jerome Newton in the film The Man Who Fell To Earth. Based on two images, the original US TMWFTE poster and a still from the film. You can enjoy all of the pieces on display at the exhibition for one more month as the exhibition closes on July 15th. Brooklyn based Hyperallergic have published an article by Jan Åman, a respected curator, writer, columnist, based in Stockholm, Sweden. Titled David Bowie, the Nobel Prize, and Panic in Stockholm, the piece centres on the current drama around the Swedish Academy, which “has reached Shakespearian proportions, and might even flip the way we look at contemporary culture.”. Not many people noticed it, but right after Bob Dylan became the 2016 Nobel Prize laureate, the (until recently) Permanent Secretary of the Swedish Academy, Sara Danius, was asked her personal opinion on Dylan. She answered, almost en-passant, that she was more of a Bowie fan, thereby slipping us a key. Bob Dylan had for ages been mentioned as a possible Nobel Prize winner. But Bowie — that was a different twist. What I realized then and there was that the spirit of David Bowie has hovered over the way she has been staging her job ever since she became the Permanent Secretary of the Swedish Academy. When, in 2015, Danius made her debut in the job, she descended the staircase to the Nobel Dinner in the Blue Hall as if it were a truly historical world stage. She was wearing a gown designed by Pär Engsheden in close cooperation with Danius herself, a dress well beyond normal contemporary standards. . Her way of heading the Academy can very well be compared to David Bowie’s entry into London’s world of rock’n’roll in the 1970’s. Bowie sensed his own greatness and was able to cope with it, as many great artists do, by surpassing his context. David Bowie was the opposite of your ordinary rock star. He invented a series of alter egos to distance himself from a market that would swallow the identities of many other, less savvy musicians. He turned himself into Ziggy Stardust and Aladdin Sane, personas that enabled him to play with pop culture’s soon-to-implode future. He handled the leap across the Atlantic to the US by turning himself into The Thin White Duke — and kept on changing even after his death (”dropped my cell-phone down below…”). The photographs taken by Carl Bengtsson of Sara Danius in Engsheden’s gowns are related to the shape-shifting images of Bowie and Duchamp: They make her into an actor. She and the Academy are decidedly not the same. They are different entities, coming from different worlds. Compare Danius’s gestures with the demeanor of Horace Engdahl, a previous Permanent Secretary, who is rumored to be her leading opponent in the Academy turmoil. In photographs taken outside the Academy building at the height of the scandal, he is seen laughing at journalists as if he embodied and personified the entire institution. He laughs as if he were the Academy laughing. Conincidentally, Engdahl’s writing has largely focused on German Romantic poets. The Thin White Duke and Rrose Selavy are thus pitted against the doomed poet Friedrich Hölderlin. Externalizing against internalizing. A distanced persona against a self blurred with its context. Friedrich Hölderlin (1770-1843) lost his mental health and lived the last 36 years of his life in the house of the carpenter Ernst Zimmer, out of touch with the external world. Is this the destiny awaiting the Academy? Or will the furor be an opportunity for reinvention, for multiple roles in a rapidly expanding cultural universe? As work of contemporary art, the Academy scandal has a potential to disrupt an old institution, as well as old models of cultural production, as they turn and face the strange — ch-ch-changes. 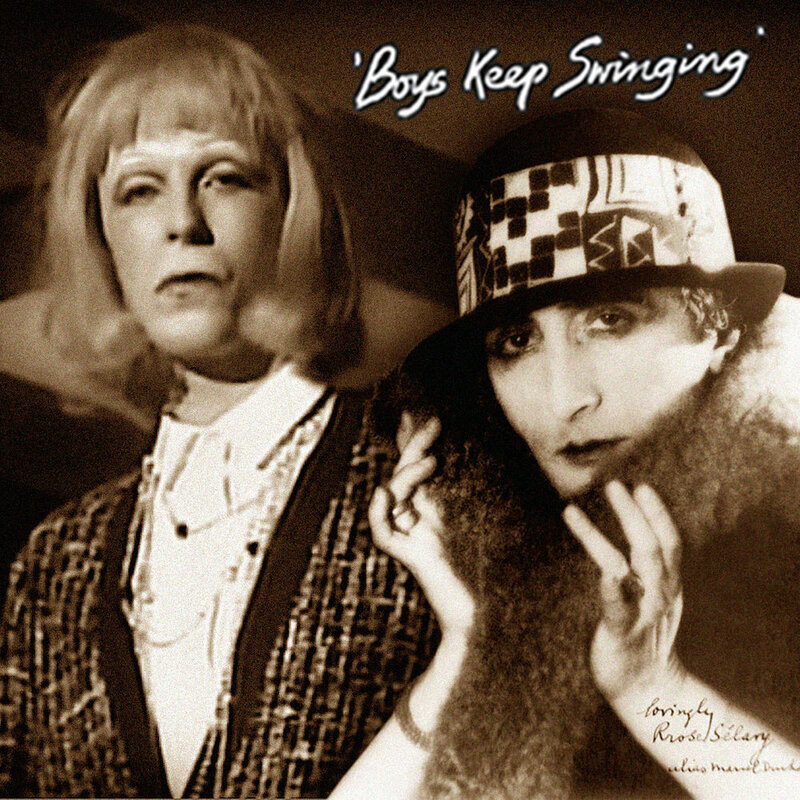 FOOTNOTE: Pictured here are David Bowie as unspecified female (but possibly a nod to his co-star Marlene Dietrich in Just A Gigolo), in the 1979 promo video for Boys Keep Swinging. And on the right is aforementioned Rrose Selavy (Marcel Duchamp), pictured by Man Ray in 1920. © Man Ray Trust/ADAGP. Today’s painting is based on an image taken by Steve Schapiro during the recording of David’s appearance on The Cher Show in 1975. Enjoy this and many other iconic shots in Steve Schapiro’s superb BOWIE book. You can view all of the pieces on display at the exhibition until July 15th. Tickets and details of other Bowie-related events at the Brooklyn Museum here. More of E.V.’s dolls, including many more Bowie ones, can be found here. David himself expressed his appreciation for E.V.’s work back in 2013. The David Bowie is New York edition marks the culmination of the spectacular V&A touring exhibition – which has now been seen by nearly 2 million people across the world. 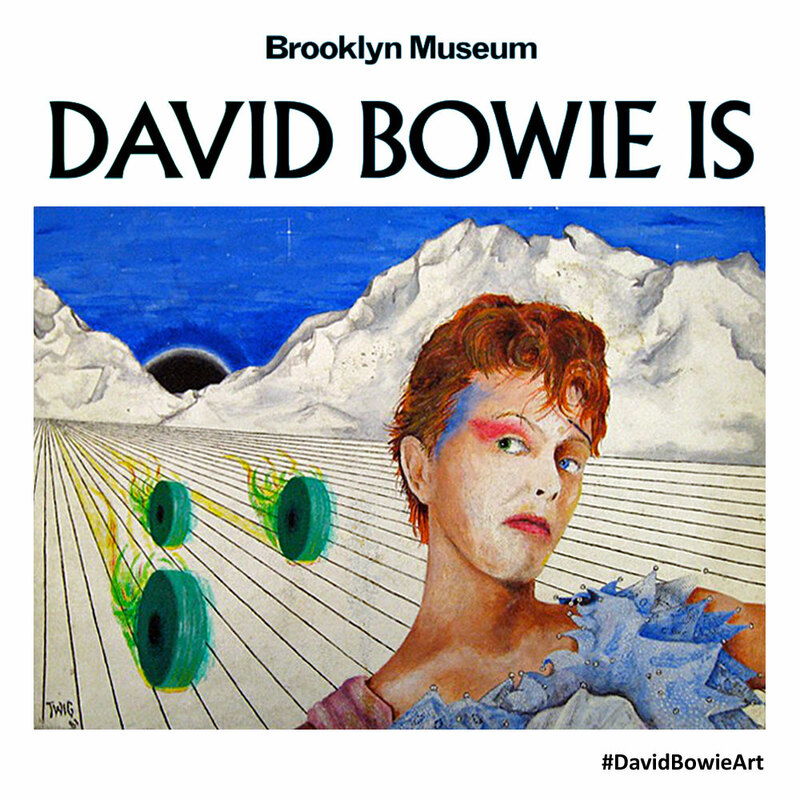 Produced in close collaboration with The David Bowie Archive, it includes an additional selection of NYC material chosen for the final destination of the tour, the Brooklyn Museum of Art. Created by the Barnbrook studio, with the original team who worked on the first edition, each element of this celebratory edition has been carefully selected, and specially printed, for the 1000 copies available. The orange highlight colour is now replaced with silver throughout, radically changing the appearance of the book. The Brooklyn Museum display represents the final bow of the exhibition, and this final edition of the publication will provide a fitting memento. 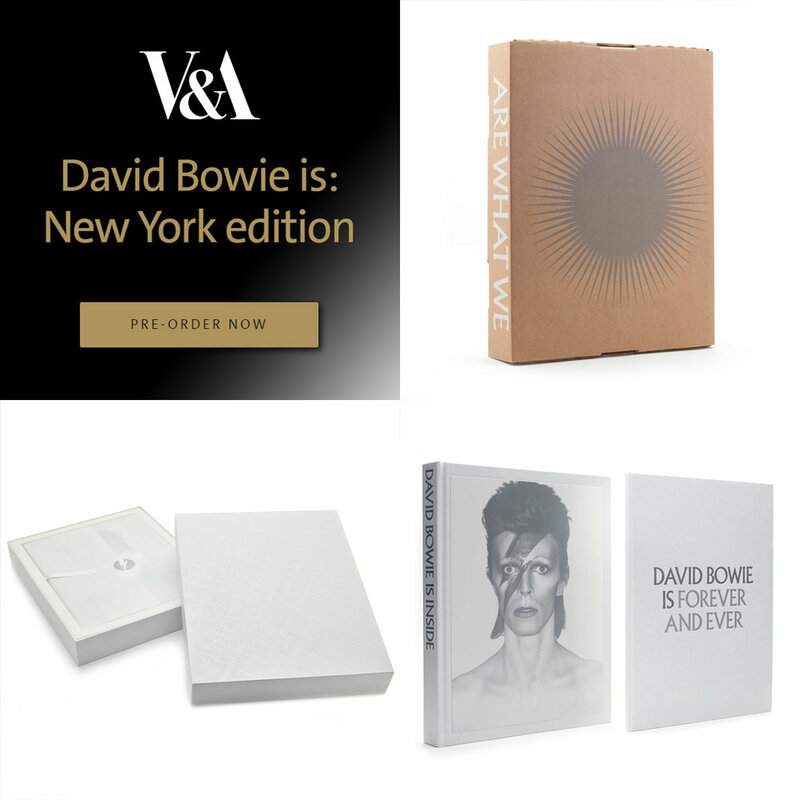 ~ A 32-page, French-folded hardbound booklet with additional New York material from the David Bowie Archive. The pages are printed on a 90gsm light-weight uncoated paper, printed 4-colour plus one metallic silver pantone colour on the outer pages, and 1 metallic silver pantone on the inner pages. The book is bound in white cloth, and embossed with 2 contrasting silver foils. The book is swiss-bound, with silver endpapers. ~ A copy of the original publication, reworked in silver rather than orange, with a silkscreen print on the cover and 2 ribbon markers. The book is bound in white cloth, and embossed with 2 contrasting silver foils. A metallic silver pantone ink is used in the printing of the book, to match the booklet. ~ A white display box, printed with a raised spot varnish finishing over a soft-touch lamination. The book and booklet are wrapped in white tissue paper inside the display box. ~ The box is wrapped in white tissue paper and placed inside a bespoke mailing carton, also designed by Barnbrook studio. If you’re kicking around the West End of London early this evening, multi award-winning designer and non-stop Go-go dancer, Jonathan Barnbrook, will be giving a 30 minute lecture showing the process of designing the record covers for Bowie’s Next Day and ★. Taking us through the rough stage and public reaction after release. It is followed by an optional short logo design workshop. FOOTNOTE: If you’re wondering why the Barnbrook-designed Legacy sleeve is more prominent in our montage, it’s in celebration of the album recently being certified platinum by the BPI. A quick reminder that the Ceci N'est Pas David Bowie exhibition of Bowie portraits by Sara Captain opens at La Galerie Stardust/Mood in Paris at 19:00 hours this evening. The show runs through to 15th July and you can preview the work via this Facebook gallery of Sara’s Bowie paintings, along with more info regarding Ceci N'est Pas David Bowie here. Sara’s work also graces the cover of the upcoming issue #4 of Daniele Pensavalle’s superb Italian Blackstar Fanzine. Stay tuned here for more details.